Apple has reportedly been granted a patent for a technology implementation that may allow future Apple devices to detect toxic gases, including carbon monoxide, sulphur dioxide, and methane. Spotted by a website tracking Apple patents, the new patent details the company’s miniature gas sensors that will come with features like improved stability, enhanced poisoning resistance, and reduced signal resistance. Apple has said to have filed the patent application back in March 2018 and the company has just been awarded the patent. There is no word on when the first products including the new technology will hit the market. According to a report in Patently Apple, the Cupertino-based company has been awarded a patent for a new health sensor that will be able to detect harmful gases and notify the consumers of the toxic environment around them. The company seems to be building robust miniature gas sensors that can put in Apple devices like iPhone, Apple Watch, and iPad. 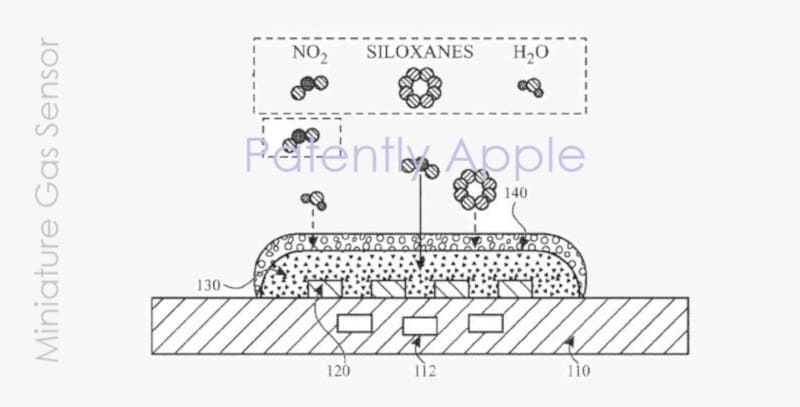 The patent reveals that the Apple sensors should be able to detect ozone, nitrogen monoxide, nitrogen dioxide, methane, carbon monoxide, sulphur dioxide, and volatile organic compounds. Additionally, it will also be able to sense siloxanes, sulphates, phosphates, and chlorides. Given that it is just a patent, the actual commercial implementation plans of these sensors is a mystery at this point, but Apple Watch and iPhone seem like good option to pack something like this in. Apple is increasingly focusing more on health and this certainly seems in line with that company objective. Even Tim Cook recently told CNBC that decades from now, he wants people to remember Apple for its great contributions to health.